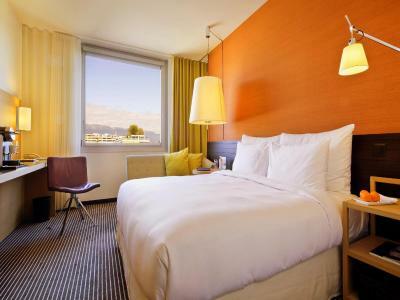 Lock in a great price for InterContinental Geneva – rated 8.6 by recent guests! Staff was very friendly and helpful. Room service and food was excellent. Room felt fresh and bed was comfortable. Shower, towels and toiletries as well as minibar were of high quality. The staff is amazing and very friendly and attentive. The breakfast buffet was wonderful and plentiful. The interior design of the property itself is very pleasant. The pool is clean and well run, with lovely service. The concierge, Nicholas, went out of his way to be helpful, as did Ibrahim at the front desk. The rest of the front desk staff could brush up on their people skills. Excellent facilities and very friendly staff but the highlight was the front desk officer Laura. She was incredibly nice and made our stay much more enjoyable than otherwise it would be. The staff was super friendly, they were also quick in responding to requests and overall very helpful. The staff was very helpful and polite. Pretty hotel. We needed a place near the airport for one night on both ends of our ski trip. 5 minutes to airport and close bus ride to downtown. The staff and concierge are first class. Pool was closed for an event but the staff did an extraordinariy job to find us another pool and provided the transportation. Everything is fine! The bed in the room was very comfortable, the hotel location has the quiet environment and the staff was very warm. InterContinental Geneva This rating is a reflection of how the property compares to the industry standard when it comes to price, facilities and services available. It's based on a self-evaluation by the property. Use this rating to help choose your stay! One of our top picks in Geneva.Featuring an inviting summer outdoor pool, the InterContinental Geneva is just a 3-minute walk away from the United Nations and an 8-minute bus ride from Geneva Airport. 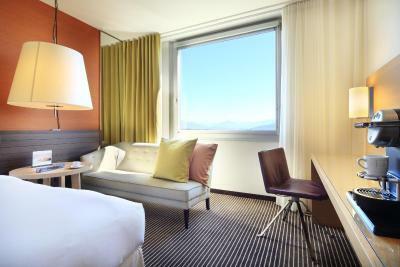 Amazing views of the Mont Blanc, Lake Geneva and the city from the upper floors and the 24-hour health and fitness center are further highlights of the InterContitnental hotel. Within a 5-minute bus ride you can reach the CICG congress center and the Palexpo fairgrounds. 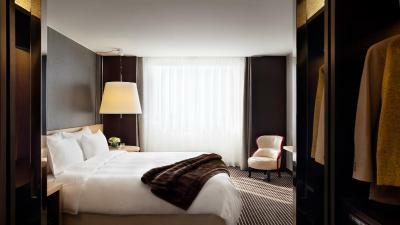 The spacious and elegant rooms at the InterContinental Geneva have free WiFi, free tea and coffee making facilitie and are air-conditioned. As a luxury amenity, you will get access to PressReader for your table or smartphone, offering over 5,000 digital newspapers and magazines including the Washington Post, Elle, Business Traveler, the Globe and Mail and Le Monde in a wide range of languages. Dining options include modern international cuisine and seasonal specialties served in the gourmet restaurant, which features a well-stocked wine cellar and a terrace by the pool. At the bar Les Nations, guests can enjoy a wide range of drinks, listen to live piano music, and browse in books and magazines. A sophisticated urban-style bar, Le Fumoir seduces you with its original cocktails and a selection of international cigars. The 1312 ft² Spa by Clarins offers a complete set of beauty and massage treatments. The health and fitness center is accessible 24 hours free of charge and there is a also a seasonal outdoor pool for spending relaxing hours during the warm summer months. Cointrin Airport and Cornavin Train Station are a 5-minute drive from the InterContinental. Guests benefit from free public transports in Geneva during their stay. The Luxury Shopping area is a 5-minute drive away. Petit-Saconnex / Servette is a great choice for travelers interested in convenient public transportation, scenery and old-town exploration. 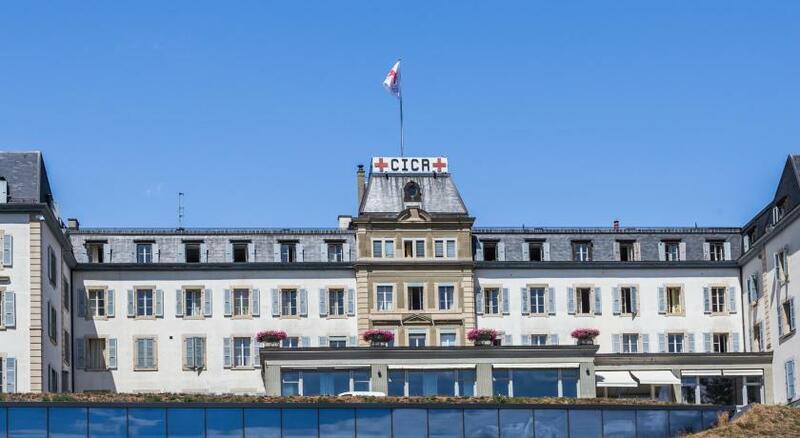 When would you like to stay at InterContinental Geneva? 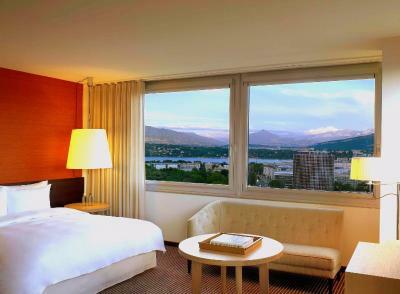 This air-conditioned room offers mountain views, contemporary elegance and free WiFi. You have free access to the business center, the fitness center, the outdoor pool and the sauna and spa bath. Please note that extra beds or baby cots are not available in this room type. Private parking is available on site (reservation is not needed) and costs CHF 36 per day. This spacious and elegant room has 45 square yards and features an additional lounge with a comfortable sofa and large dresser. There is also a work desk with panoramic views and free WiFi. Guests benefit from an espresso coffee machine and bottled water. Located on higher floors, these modern, air-conditioned rooms feature a work desk and offer city views. You have free access to the business center, the fitness center, the outdoor pool and the sauna and the spa bath. Connecting rooms (to another Deluxe room or an Executive room) are available upon request. You have free access to the business center, the fitness center, the outdoor pool, the sauna and the spa bath. Fitted with modern furnishings and offering additional space, this suite features a Nespresso machine and panoramic views. Featuring refined design and furnished with luxurious amenities, this suite includes a large dressing area, a panoramic desk and windows overlooking the lake. Guests can enjoy free access to the business center, the fitness center, the sauna and the hammam. Hotel surroundings – This neighborhood is a great choice for travelers interested in convenient public transportation, scenery and old-town exploration – Check location Great location - show map Guests loved walking around the neighborhood! House Rules InterContinental Geneva takes special requests – add in the next step! InterContinental Geneva accepts these cards and reserves the right to temporarily hold an amount prior to arrival. Please note that the main restaurant is closed on Saturday for lunch and dinner. Guests can dine at bar Les Nations instead, where a full menu and the restaurant's wine card are available. Elevators are quite noisy - can be heard from the room if the room is close to them. Obligation to log in to wifi network again every day. Everything was simply very good! The staff is good The price was more than the room deserves. However, I had my daughter stay with me for no extra charge except the city tax. That was really kind. The room was small but clean. The bed mattress was not solid enough. It was acceptable though. All in all it was a nice stay. The crossiants were extra flakey and just melted in your mouth. Lovely hotel nice bar & restaurant. Lovely rooms and communal area. Pool not available as out of season. Bus stop outside for easy access to central area and old town 10-15 min journey. Highly recommend this hotel just outside the city. Room, especially bathroom very dated, but modern in communal areas. Beds comfy and staff were friendly. Very helpful arranging extra beds for the room and onward travel arrangements. Aircon in the bedroom was noisy. Very professional staff. Excellent restaurant. Good location near airport. A bit far from the center, but I knew that when I booked the hotel. Service was simply excellent. Nice bar. The bathroom is so small!